I don’t know Finnish, but I’m pretty sure the blogger didn’t post a pattern for it. *Correction: after 30 seconds of browsing the site, I did find the pattern. Oh well! So here’s my version. It’s called the Ice Cream Sundae Hat and it’s lovely. I made it up as I went along and the pattern is simple enough that I don’t think I need to provide a chart as long as you follow the instructions. Special notes: You’ll be knitting a basic fair isle pattern, so carry the unworked yarn across the back of the stitches you’re working, being VERY CAREFUL not to pull the unworked yarn too tightly. Your hat will shrink significantly in diameter if you don’t pay attention to the unworked yarn. I intentionally made my pattern bigger than my normal hats to account for my habit of pulling too tightly. On your circular needle, cast on 80 stitches with Color A. Place marker on needle. Knit into the first stitch, being careful the stitches aren’t twisted. K2, P2 for five rounds. Knit 3 rounds regularly. Round 9: With Color A, Knit 3 stitches. *With Color B, knit 4 stitches. With Color A, knit 6 stitches. * Repeat ** till end of round (you’ll end by knitting 3 stitches with color A). Round 10: With Color A, Knit 2 stitches. *With Color B, knit 6 stitches. With Color A, knit 4 stitches. * Repeat ** till end of round, ending with 2 stitches of Color A. Round 11: With Color A, Knit 1 stitch. *With Color B, knit 8 stitches. With Color A, knit 2 stitches. * Repeat ** till end of round, ending with 1 stitch of Color A.
Rounds 12 & 13: With Color A, knit 1 stitch. *With Color B, knit 9 stitches. With Color A, knit 1 stitch. * Repeat ** till end of round. Cut Color A leaving a six-inch tail. Knit 5 rounds with Color B.
Repeat rounds 9-13 with Colors B & C.
Knit 6 rounds with Color C.
Round 5: K2tog, K 4 for one round (this is where you should probably switch to the double points). Cut yarn leaving a 12-inch tail. Gather remaining stitches with a darning needle and fasten off. Weave in all tails. I recommend a pom pom maker, which you can buy for about $6 at any big-box crafts store. Another super technique I found on Pinterest, where you use a serving fork. It’s pretty great if you’re feeling lazy. 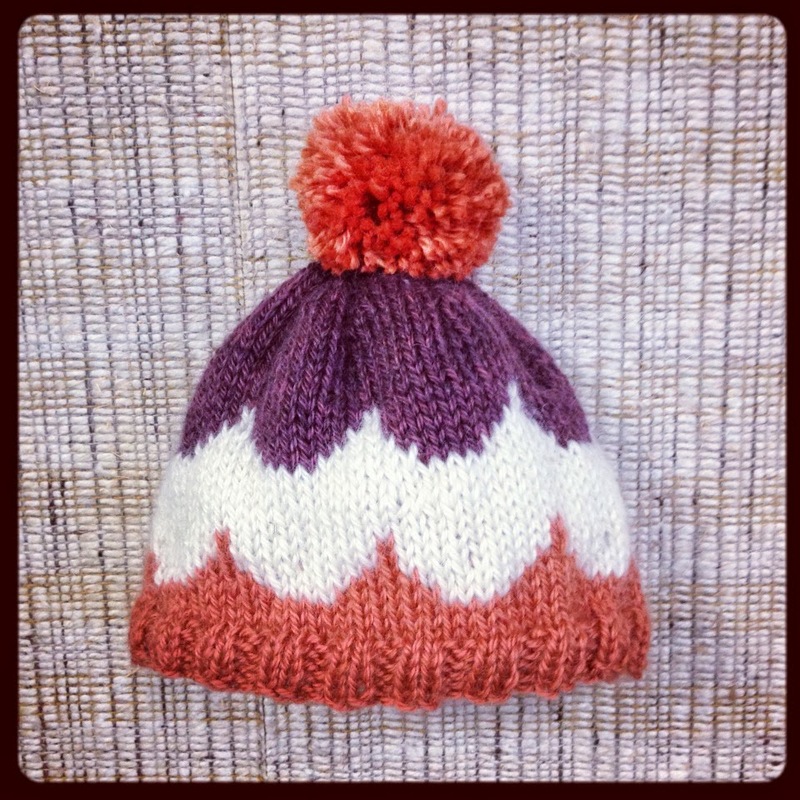 Secure your pom pom to the hat using yarn and a darning needle. 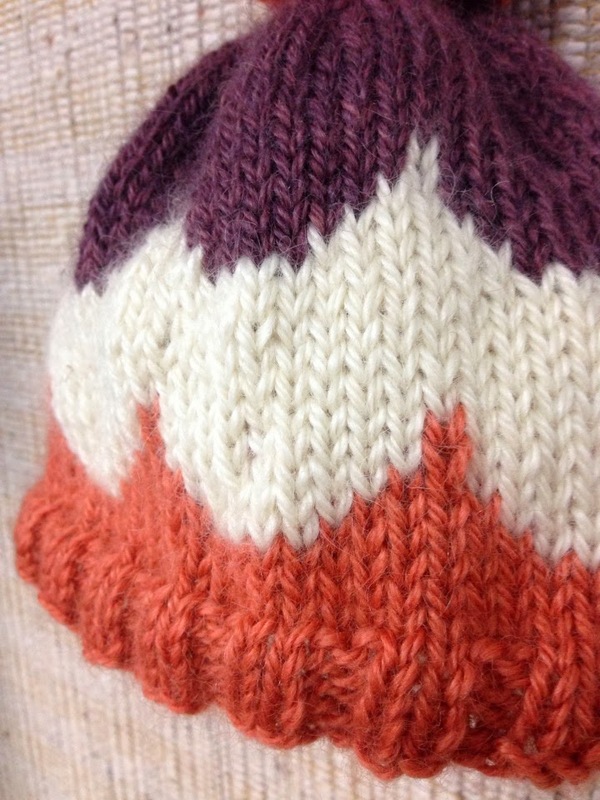 Run the yarn through the pom pom a couple of times and tie on the inside of the hat. I always try and leave a little length in case the pom pom loosens so I can easily refasten it. Thanks again to Muita Ihania for the pretty design. Please contact me if there are any errors in the pattern. I’ve already given the hat away so I wasn’t able to look at it as I was writing the pattern. 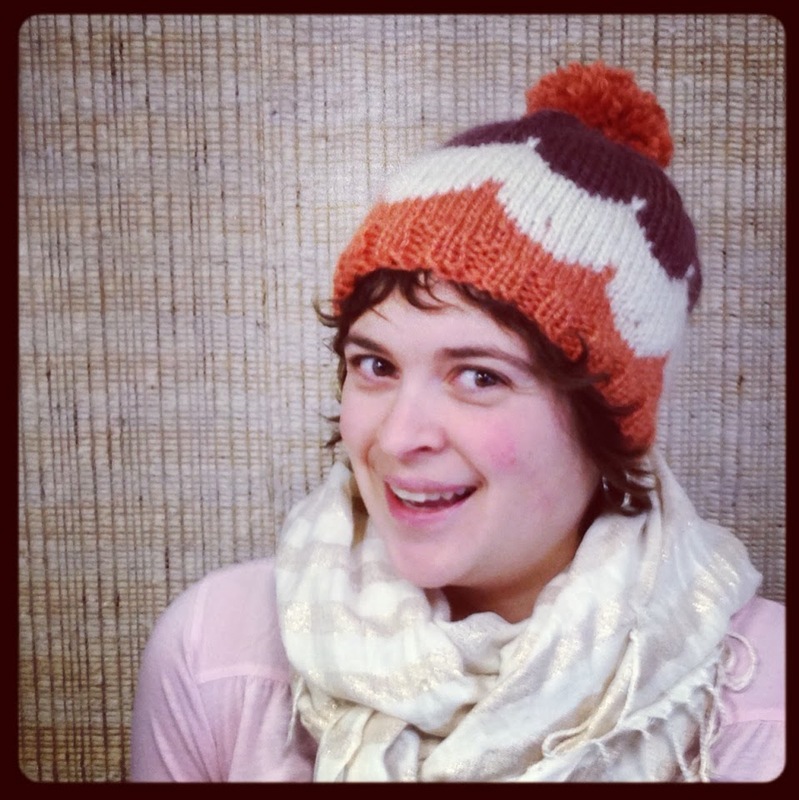 This cute little hat showed up in my email this morning from AllFreeKnitting. I love the color combo here, and have already started following her blog. She has more adorable knits, recipes, and other goodies that I’ll have to dive into sometime soon. Thanks for your kind words about my pattern and blog. I look forward to checking out your site further. Thank you. Your hat is too adorable not to share. The pattern is adorable but does not print. Is it shown anywhere else. If that doesn’t work, I suggest copying and pasting the text into a word processor, changing the text color to black and printing it from there. Loving this hat! You sound like a very busy lady. Keep on knitting. It’s the holidays — they keep me very busy. Thanks for your kind words Yvonne! I’d love to see what color combos you come up with. I have mushrooms in my yard. They are just coming up in the grass they look like whit golf balls and one is taller and odd shaped my neighbor wants to pick them and I don’t know if they’re safe to eat. I don’t have any trees in my back yard so they’re not growing on trees just in my grass area. How can I tell? It sounds like they are puffballs but without seeing photos of them from several angles I wouldn’t be able to tell you what they are. My recommendation is to see if there is a science center in your area and bring them a sample of your mushroom. I just signed up to receive emails for your beautiful Knit nat Alaska news letter. I mostly crochet but I want to start doing more knitting. I love the Ice Cream Sunday hat. I read the pattern I should say scanned and didn’t see where to use the double point needles. Or do you mean that the circular needle has double points? Thank you for following my blog! I’m glad you like my ice cream sunday hat pattern. In round 5 of the decrease pattern I recommend switching to double pointed needles since it will start to feel tight on the circular needles at this point. I would love to make this for my granddaughter, she is 10 yrs, old Do you have it in that size? Hi Ellie, I would recommend following the same pattern but use worsted weight yarn on size US 9 needles. It should come out slightly smaller that way. Although a 10 year old head is usually not much smaller than an adult’s so the regular pattern might just fit fine. I love the look of this happy hat. I have a question: does the pattern for Color B needs to be symmetrical? because mine is not. Just for Color B this is what the pattern says R9) knit 4; R10) knit 6; R11) knit 8; R12) knit 9; an increase of 2 stitches, but not for the R12. Can you please help? Thank you. It’s been a very long time since I’ve made this hat, but you are correct that the pattern is not symmetrical. One side of the scallop is slightly shorter than the other side. That being said, I’m afraid I wouldn’t know how to advise you on round 12 without having the work right in front of me. If there’s an error in my pattern and you’re able to work your way through the typo, I would love it if you could let me know. I don’t have the ability to make the pattern right now. Thanks for bringing it to my attention. I will try in the near future to make the pattern again and see if I run into any errors. No worries Natasha, looks great anyway. I will try to redo this hat it in different colors and create a symmetrical pattern, but I am new at this and not sure if will work. So glad you enjoy this pattern, Carol. Best of luck knitting!